Three years ago, Sledgehammer had just finished propping up an Infinity Ward devastated by the departure of half its staff to Respawn Entertainment. They’d made another game about Russian ultranationalists in Modern Warfare 3, and were tasked with conceiving the Next Big Threat for Call of Duty: Advanced Warfare. The scenario planner wasn’t worried about a new Cold War, a joint assault by Islamic extremist states, or even China – which he claimed will “eventually collapse under its own economic weight”. Rather, he said that the US’s greatest realistic threat was from a rogue private military company. Sledgehammer were writing the game as Europe’s economy was falling apart, and it seemed PMCs would only become a more attractive prospect for nations without the coffers to fund a large standing army. So, uh, there you have it. The absurd collapsing of the Golden Gate Bridge in Advanced Warfare is an all-too-real nightmare for the US government. Or at least, the premise behind it is. 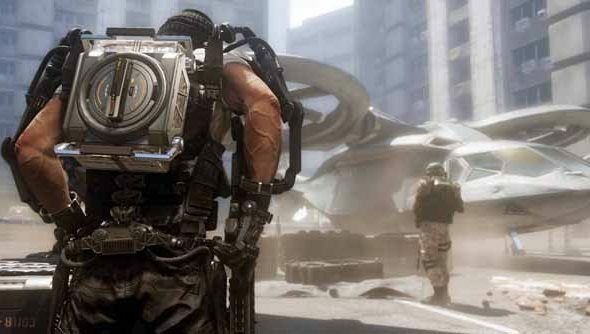 A year ago, Activision’s Dan Amrich claimed that Call of Duty: Ghosts’ lightning rods from space were “more science than science fiction” – and Condrey has previously suggested that Call of Duty is believable and relatable. Are you kept up at night by CoD’s visions of jetsetting villains?